Additional resources: Link to the free online CLV calculator, ideal for students to play around with. 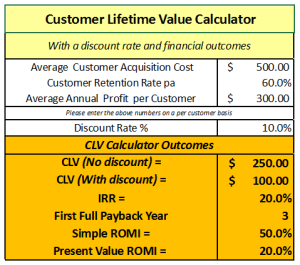 Plus here is an example customer lifetime value calculation. 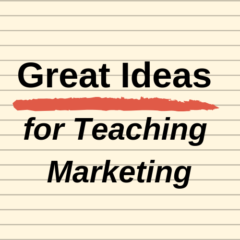 Notes: There is another activity on this site that provides a simple introduction to the customer lifetime value formula. 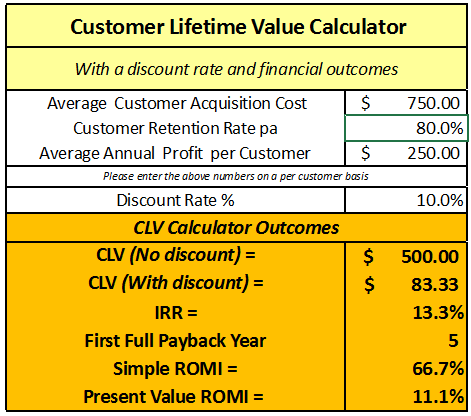 Your task of this customer lifetime value activity is to compare the following two measures of customer lifetime value for two different firms. Below is the output from the online customer lifetime value calculator for both of these firms. The white section of the calculator is the input and the gold section is the output. Two customer lifetime value numbers have been provided, with the second one take into account the discount rate. IRR is the internal rate of return, which is the percentage return on the acquisition cost over time. The simple ROMI is the customer lifetime value (without discounting) divided by the acquisition cost. 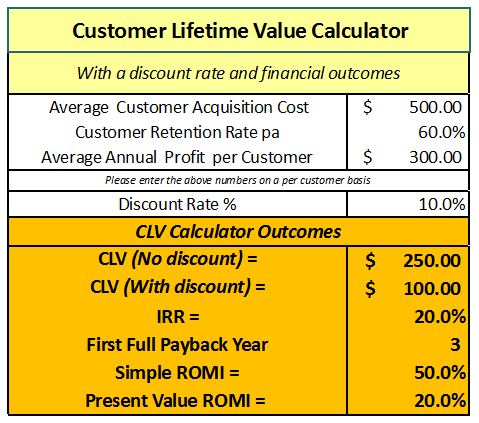 And the present value ROMI is the customer lifetime value with discounting divided by the acquisition cost. 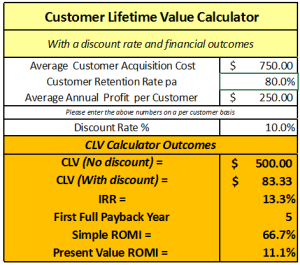 Which company has the more impressive customer lifetime value calculation? Which metric/s did you consider to draw this conclusion? What are the key differences between the two firms, based on the elements of the customer lifetime value calculation? What elements do you suggest that these firms work on in order to improve their customer lifetime values? Are the additional financial metrics provided at the bottom (e.g. internal rate of return and payback) helpful of distracting in distinguishing between the two firms performance?